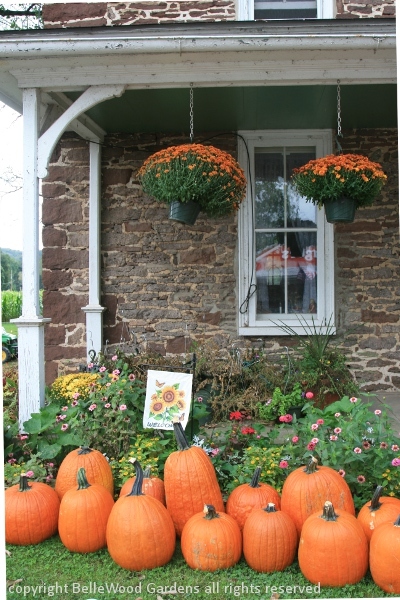 Off to Trauger's Farm Market over the river in Kintnersville, Pennsylvania to buy another half bushel of plum tomatoes to make oven roasted tomatoes. 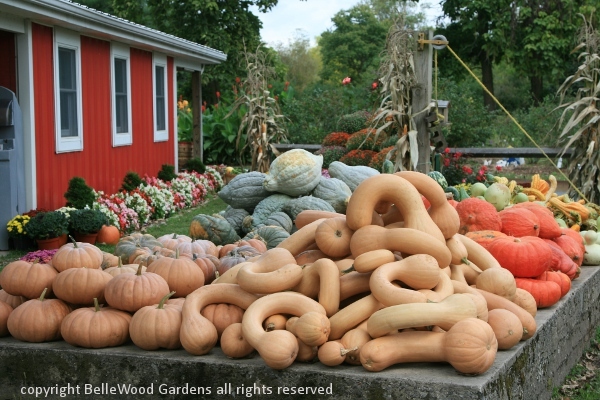 Between last week and this week they've been inundated with pumpkins, a veritable plethora of pumpkins. 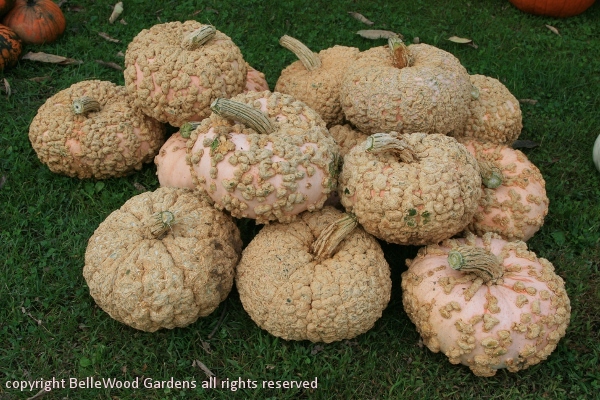 And if you think that pumpkins are always orange and best suited to carve into Jack o'lanterns, think again. 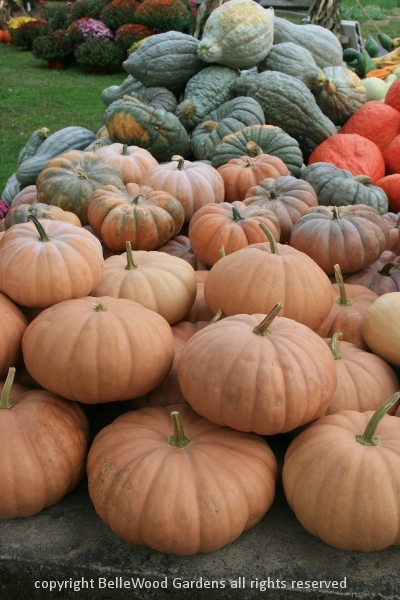 Pumpkins come in different colors, different shapes, different sizes. Cinderella would have her choice of coaches. Pumpkins that cook up with wonderful flavor from soup to baked goods such as cheesecake, pumpkin bread, muffins, and more. I've made superb pumpkin butter delicately spiced with nutmeg and cardamom. Clearly, as well as tomatoes I need to buy a pumpkin. But first, I need to photograph. 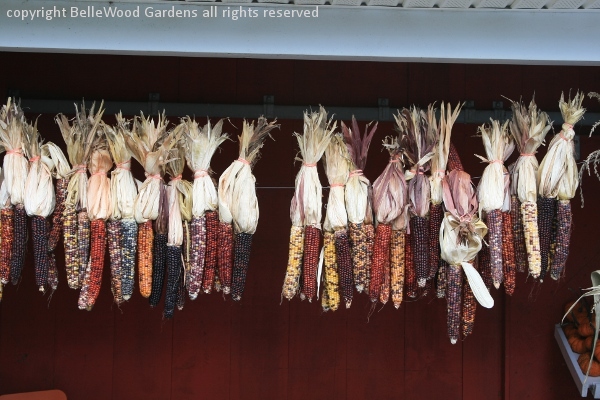 Only problem - this is a farm stand, not a botanic garden. No labels. 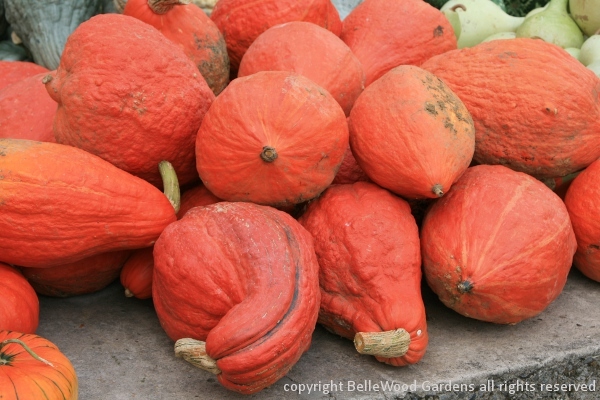 So some of these beautiful pumpkin cultivars are nameless. If you do know an identity, please do contact me. Update: I was talking to Ken Selody of Atlock Farm today, [Head's up - if you visit the Atlock Farm site you'll hear some music by the jazz group called Some Like It Hot Club that played at his tomato Tastemonium event this past Sept 1st.] and he suggested I look on Baker Creek Heirloom Seeds. Good call! I was able to identify another couple of pumpkins. But there are still a few nameless ones. Common folks, help me out. Thanks in advance. 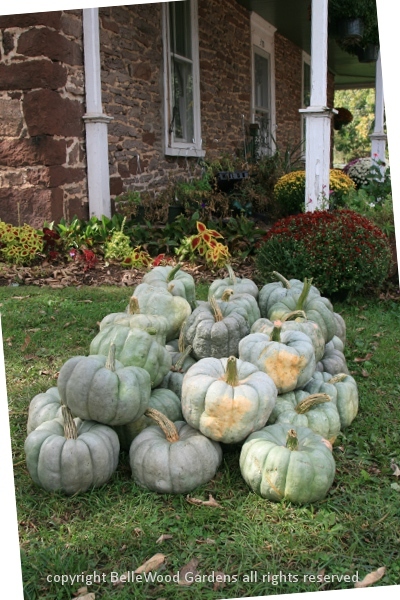 Pumpkins piled up before the beautiful old stone farm house. 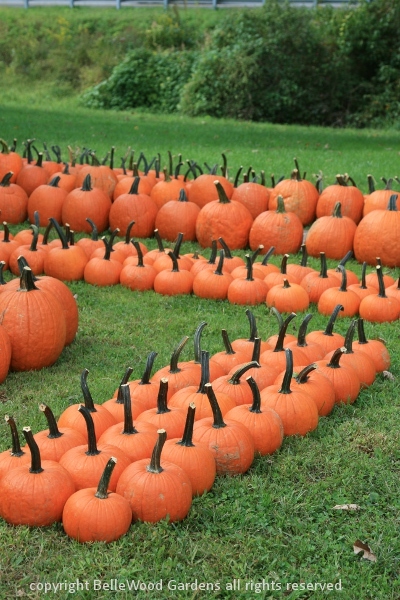 Big and little, lots of orange pumpkins, marching off in tidy rows. Marbled, dappled, netted with green. Not green as in not ripe, mind you, it's the way these pumpkins mature. Cheese pumpkins, so named because they're flatten like a wheel of cheese. This cultivar, in addition, has a warty rind. quite popular here in the United States. It is excellent for soups, stews, casseroles. 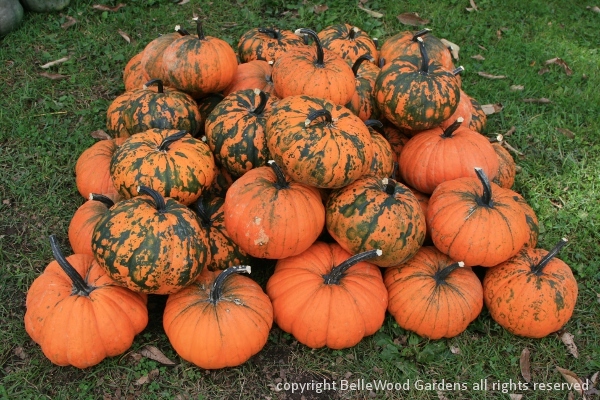 The yellow blotches on some of these gray pumpkins are merely where they lay on the ground in the field. This could be Jarrahdale, or perhaps Early Jarrah. Another useful pumpkin for culinary purposes. 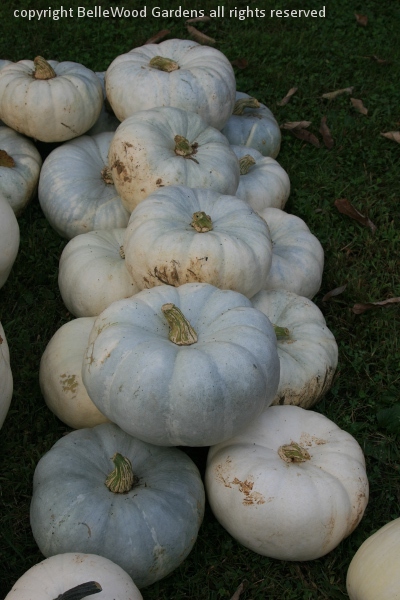 Pale gray pumpkins. Different, their segments are not as deeply incised. A heap of cheese pumpkins <>(my favorite for cooking) and blue hubbard squash. 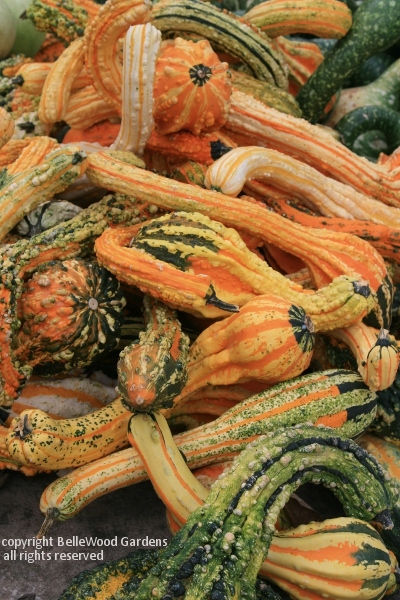 You might need an axe to split the squash, and its one of the best long keepers in winter. 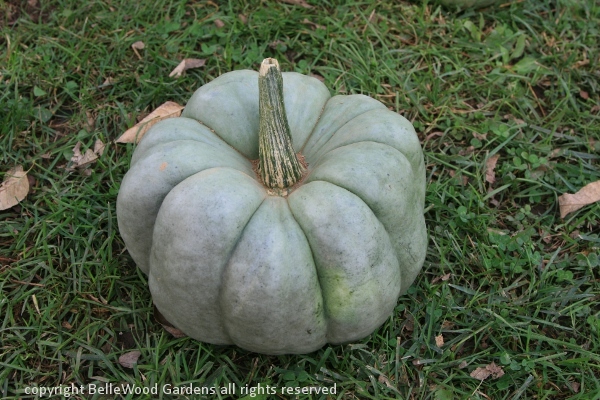 The cheese pumpkin is likely Long Island pumpkin. The one I chose weighed 14 pounds. 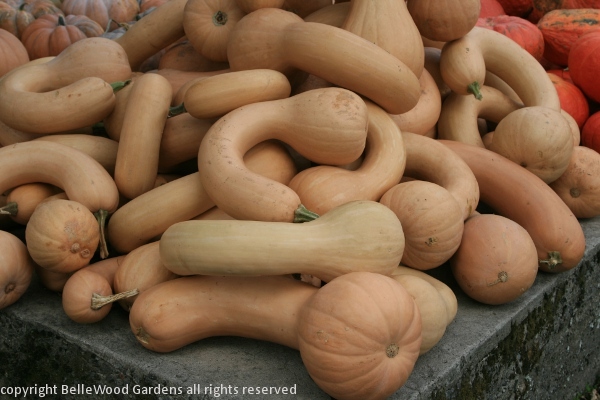 curvy-necked beauty is Tahitian butternut squash. Unless it is Pennsylvania Dutch Crookneck. with chrysanthemums to give a sense of the seasons as summer draws to a close and leaves begin to fall. 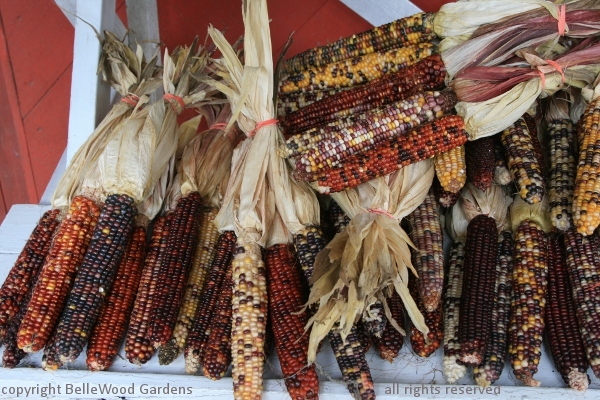 Ditto the Indian corn, whose multicolor yellow, red, and purple autumnal hues also embellish the harvest season. Beautiful own grown produce and much, much more. Let winter come. I'll think of my end of summer visits as I enjoy the food I've put by.